[HOW TO] Use your RPI as a DNS server and speed up yo' net! Cache all of those queries locally and speed up your internet experience. This guide shows you how to get a simple dns and dhcpd server running on your RPI using dnsmasq. The full guide can be found on my blog here: "DNS on Raspberry Pi -- Speed up your internet Experience"
Any feedback or comments here or on the blog or in github is greatly appreciated. Thank you! Here's something you can do with your raspberry pi that will make your internet experience faster. Set up your raspberry pi to cache DNS queries so that they can be answered locally in a fraction of time and ditch your slow ISP domain name server. But never run a command like that without first checking the source file. When you type in "www.heystephenwood.com" into your browser and hit enter, there's a little transaction that goes on under the hood. In order to visit the website, your machine must translate the alphanumeric website name into a series of numbers called an IP address. It accomplishes this by sending the query to a domain name server. The whole trip can take anywhere between 1 ms to 250 ms or more depending on your connection. This happens every time you visit a url (depending on your browser). You can test it yourself using the tool dig. That query took 130 ms. That means from the time I hit "enter" on my browser to the point where I was actually able to fetch and display a webpage there was a 120 ms pause while I waited to get the server's address. Those little pauses add up! We're going to make our internet experience faster by storing these records in memory on our own DNS cache so that they can be fetched nearly instantaneously. The best part of this is that the cache is shared for all users, so the more people you have browser the web at your house the bigger and better the cache. Dnsasq is a very lightweight dns and dhcpd server. The benefit of dnsmasq is that it's fast, very easy to use, and offers the ability to use both dns and dhcpd services under one roof. The raspberry pi makes for a perfect vessel for a DNS server because of its low power consumption and easy setup. These next steps are optional but make the transition to your own raspberry pi dns server more more fun. We'll run the loop below to get a good working baseline for our DNS speed. You can run this from your raspberry pi or from a linux or mac osx box. Let's average them and get a baseline, because what's the point in trying to optimize a system if we can't actually see if it's improved? We're going to run the same command but we'll pipe it to awk to sum the columns for us to grab our mean. In this case it's 8 hops. Generally speaking, the less hops a packet needs to travel to a destination the better. By using a cache, we'll only need to make this trip once, then we'll store the record for quick retrieval. Let's open the conf file and get the settings we want. For reference I've included my own configuration. You'll find the configuration at /etc/dnsmasq.conf if you installed from the repo. # Max cache size dnsmasq can give us, and we want all of it! # dnsmasq to serve up dhcpd requests. The "server=" setting is declaring the upstream domain name servers. dnsmasq never actually looks at root hints to resolve an ip address. If it doesn't know the answer, it just asks a different dns (in this case it's google). I've included the settings for having dnsmasq be the dhcp server as well. This is optional, but it gives you a few extra perks: the dnsmasq dns will be the default, and you can control the lease space. Note: these settings assume that 192.160.0.1 is your default gateway. If it's not, you'll need to adjust the settings to reflect it. Let's run that same command earlier. Once the record is retrieved, dnsmasq will store the record locally. From 41 ms down to 2.3? I'll take that! This part can be accomplished a few different ways. For mac, you can see this guide, or for windows you can see here. I recommend you use your raspberry pi as a dhcp server as well, that way every device on your network will use your fancy new dns server by default. Anytime you need to do something on your linux server, you should get into two habits: 1) distilling your creation into scripts that can be called over and over again, and 2) storing those configurations in source control. Let's bootstrap the whole gosh darn thing with a single bash script. echo "This install must be run as root or with sudo." echo "Testing dns performance with random urls"
# We'll generate a list of urls that we're moderately certain doesn't exist in our cache to get a good base line for speed increases. Last edited by stephendotexe on Sat Jun 06, 2015 6:35 pm, edited 3 times in total. Good, very detailed description and instructions. Thanks RPdom. You are exactly right. I'll update the configs in the git branch. I'm going to write a followup to this post about using dnsmasq and a list of known advertisement DNS names to effectively block ads on your entire network. Dnsmasq makes this kind of stuff easy. Adblock plus should be agnostic to which DNS server you use so long as you're not routing your traffic in strange ways. What happens exactly? Do ads start suddenly showing up? You are 100% right. Sorry it seems the issue was with the Adblock it self. I've installed the addon and it is blocking now. Out of curiosity where is the cache data kept? I'm not sure how dnsmasq stores the queries, but my guess is that it's an in-memory store. If you'd like to see metadata regarding your cache, you can send a sig HUP to the dnsmasq process and it will print out some relevant information into syslog. If you're interested in getting better statistics for your dns queries, you'll need to install something a little heavier duty such as bind. The RPI can very easily run as a bind server, but you don't get the added dhcpd functionality out of the box and it's also a little more difficult to set up. Very interesting and timely for me as I was just contemplating setting up a RPi as my DNS/DHCP server for the two networks I have here at home. Currently running 2 small VMs, one for DNS, the other for DHCP. You mentioned in your post that dnsmasq also did dhcp. Have you had a chance to set that up yet and if so, how is it working for you? Yes. Once you have your raspberry pi configured to handle DNS traffic, you can immediately point your computer at your raspberry pi server. Another option is to turn off your home router's dhcp server and use the dhcp server option of dnsmasq. Then whenever any computer on your network gets an IP it will also automatically start using your raspberry pi as a DNS. wildbill001 wrote: Very interesting and timely for me as I was just contemplating setting up a RPi as my DNS/DHCP server for the two networks I have here at home. Currently running 2 small VMs, one for DNS, the other for DHCP. You mentioned in your post that dnsmasq also did dhcp. Have you had a chance to set that up yet and if so, how is it working for you? I really like dnsmasq and I use it for my home network for dns and dhcp. It's simple, easy to configure, and rock stable. The real benefit of dnsmasq is that it also does dhcpd out of the box. There are a few drawbacks. The first is that dnsmasq doesn't give any real statistics, so gathering things like RTT is impossible. There is also a limit of 300 items in the cache. That shouldn't be a deal breaker for a home network. PowerDNS recursor -- supports a cache up to 10k. A little more difficult to set up and maintain. No dhcp. djbdns -- Very lightweight dns server. The only reason I don't use this is because there's no support for dhcp. Bind9 -- The heavyweight champion. Tried and true. Difficult to configure for a beginner but there's lots of documentation. Getting it off the ground as just a DNS forwarder shouldn't take very long. Sorry I didn't respond to your original question. Dnsmasq works great as a dhcpd server. You get a lot of features immediately out of the box. For example, when a host gets a dhcp lease, it also gets a PTR record and becomes searchable on your domain. To get this kind of functionality with Bind/isc-dhcpd-server you would have to do a lot of configuring. You can also very easily set static IPs from within the dnsmasq configuration file, though I don't find that very useful when I can just connect to a machine via its hostname. Hi. I'm working through the tutorial and it seems to be straightforward, but I'm not getting quite the same results. I pulled down dnsmasq and changed the conf file, but when I rerun the dig batch I'm not seeing any performance change. I have manually edited my dns settings in /etc/resolv.conf, would that have anything to do with it? justkelly wrote: ...I'm not seeing any performance change. I have manually edited my dns settings in /etc/resolv.conf, would that have anything to do with it? Lots of things could be happening. First of all, what is your performance? Paste the before and afters here so we can see what's going on. Also, be careful with changing /etc/resolv.conf. In most every modern debian distro resolv.conf is a file that's controlled by resolvconfd and will be overwritten every time dhclient is run. You can force resolvconf to use your specified DNS server by adding it to the top of /etc/resolvconf/resolv.conf.d/head the same way you would add it to /etc/resolv.conf. Any fixes? I checked and the directory /var/lib/misc is there. It's possible that the dnsmasq program cannot create the file. I would create the file manually and change the ownership to root and then try again. If you're running dnsmasq as a user other than root, you'll need to change the ownership to that user. 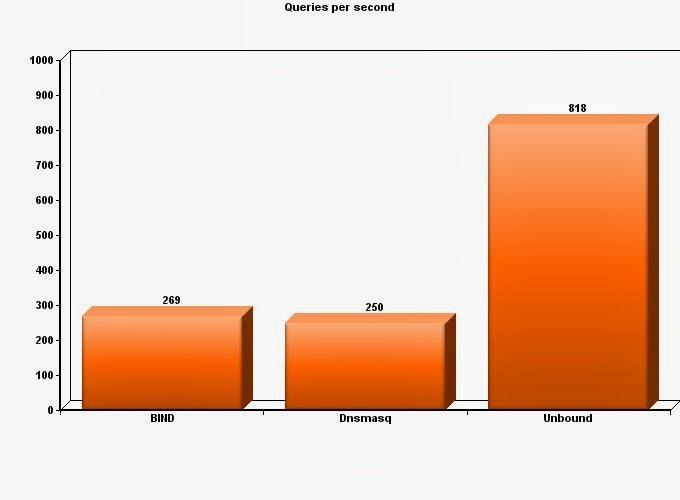 Great work, i've been testing some cache servers time ago(including with 800mhz overclock) and unbound smashes bind and dnsmasq in performance. I'm running into problems with getting the DHCP portion working. Currently, my DHCP/DNS is provided by dnsmasq on an Amahi Home Server. I want to migrate it over to the Raspberry Pi, because I've been having issues with the server. and here's the relevant portions of the amahi config files *I'm not including the /etc/dnsmasq.conf file from the Amahi, because it's long and there isn't anything uncommented in it that I know of. Any help in getting things straight is greatly appreciated. I have a problem: The cache only works until I restart the service. I checked the configuration and the resolv.dnsmasq is not present. If i create the file (and change the owner to root) it is always empty, the same is if I use the default resolv.conf. Another question: I tried measuring performance with DNS Benchmark and namebench and the pi server is always at the bottom (slow) even on the second run when the addresses should be cached. Whats up with that ? Yoda007 wrote: I have a problem: The cache only works until I restart the service. I checked the configuration and the resolv.dnsmasq is not present. If i create the file (and change the owner to root) it is always empty, the same is if I use the default resolv.conf. Could be a few reasons for both problems. Please paste your dnsmasq config so I can take a look, along with any results you're getting with namebench. Will post namebench results when it finishes (closed previous results). I would recommend commenting-out the line that specifies "/etc/dnsmasq.resolv" and attempting to restart the server. Already tried it still the same result - nothing in the /etc/resolv.conf. Edit: After reading about DNS i think I pictured it wrong. I thought that the DNS cache should be written in a file so it is read after restart. This isnt the case right ? It is probably normal behaviour that the cache is reset after each restart of the server? Last edited by Yoda007 on Wed Mar 04, 2015 4:07 pm, edited 1 time in total. Yoda007 wrote: Already tried it still the same result - nothing in the /etc/resolv.conf. By no means would I consider myself an expert. But, I think if you're trying to force it to use the servers listed in the configuration file, you need to uncomment the #no-resolv line. In theory, that should make your response times faster (as it's automatically going to the Public DNS servers). You most likely won't have anything in /etc/resolv.conf, but it won't matter (or shouldn't). I have that uncommented in mine, and my /etc/resolv.conf file only has nameserver=127.0.0.1 in it.